# 14. 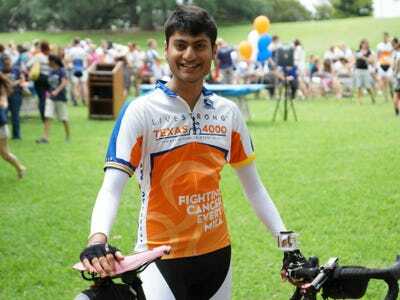 Jay Shah biked 4,500 miles to raise money for cancer awareness. Jay Shah spent his summer cycling from Austin to Anchorage, Alaska, with an organization called Texas 4000, which coordinates the longest charity ride in the world. After training for more than a year with 68 other undergraduate and graduate UT students, Shah set out on the 70-day, 4,500-mile trek with the goal of raising awareness and funding for cancer research. In addition to personally collecting $6,500, he directed programs in 23 cities along the route. These events explained why they ride, shared cancer statistics and survivors’ stories, and encouraged people to get screened. Out of the saddle, Shah juggles three majors — business, finance, and computer science — while maintaining a 3.9 GPA, and is heavily involved in academic research. He’s written an algorithm that quantifies the correlation between a city’s Twitter activity and its citizens’ quality of life, and another that teaches a computer to buy and sell concert tickets using machine learning. He blogs about his research and has been read by more than 30,000 people from around the world. This summer, Shah will intern at McKinsey & Company in a management consulting role. He hopes to one day tackle challenges facing the automative and non-profit sectors.